"Regina Angelorum", (Latin for 'Queen of the Angels') is yet another stunning display of the Bougereau's talented creation, imagination, and faith. Regina Angelorum is but one of the many titles that Catholics hold dear in referring to the Mother of God. 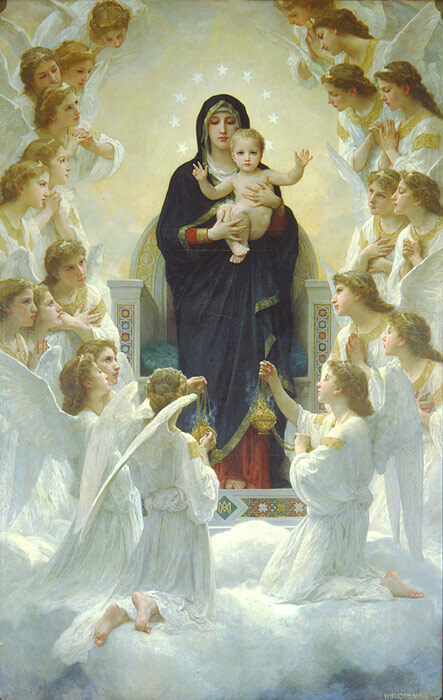 Here she is found, as always, with the Redeemer of the World, her Son, gathered with glistening angels. The arrangement in this painting of Bouguereau is similar to altarpieces completed by the High Renaissance painter Raphael (see "The Sistine Madonna", for instance) in its balance, symmetry, and composition. SPECIAL NOTE : The painter will make the reproduction as close to the original oil painting as possible. If you want your painting to alter from this likeness, please email us and " Regina Angelorum, 1900 " will be reproduced according to your special requirements.